The slogan, “We want to live” isn’t just a catchphrase yelled by the Gaza residents demonstrating in the Strip last week against Hamas, it’s also the name of a Facebook page that has thousands of followers and on which there are dozens of very harsh anti-Hamas posts. “At a time when the [popular] movement went out to demonstrate, suddenly Qassam [Iz al-Din al-Qassam, Hamas’ military wing] comes out to march. By God, the ones giving them these damned ideas are the Jews,” wrote Mohammed al-Masri, who accused Hamas’ military wing of deliberately undermining the public’s right to demonstrate. “How can it be that the young people of Iz al-Din al-Qassam be satisfied with the poverty they’re in while their leaders are the greatest money launderers, collecting millions by begging all around the world?” asked Nael Khader. A short search on the Facebook page reveals a video clip in which a Gaza woman is incensed over the death of a young demonstrator shot by Hamas fire. “Why does the 20-year-old son of a senior Hamas figure have everything he wants, a house and a jeep and a car, and he can get married, while the ordinary people have nothing, not even a piece of bread?” The woman, from Dir al-Balah, is directing her anger at a Hamas commander, who asks her if she saw who fired, and if he wore a police or army uniform. “He wasn’t in uniform, but I can assure you that he was a member of Iz al-Din al-Qassam,” she said. The mass protests in Jabalya, Dir al-Balah and Khan Yunis are not the first time that Gaza residents have protested against the economic crisis in the Strip. It’s also not the first time that posts critical of Hamas have appeared on social networks. Two years ago there were videos that showed how associates of Ismail Haniyeh, the former Hamas prime minister, enjoyed luxuries and revealed how Hamas men brutally dispersed demonstrations. But it seems that this time the protests are more sweeping and intense, and the public response to how the demonstrations in Jabalya were broken up are pushing the envelope. The nature of the protest is evidence that fear of the Hamas regime has deepening cracks, and that awe of its power is gradually fading. The cancellation of the demonstrations along the border this past weekend may have been attributed to Hamas’ response to Egyptian intervention and its insistence that the rockets fired at Tel Aviv last Thursday were a “mistake.” Hamas also issued warnings against any violations of its orders – and this time the orders were to maintain quiet. But it’s possible that Hamas itself isn’t totally certain that after the tough dispersal of the demonstrations, which included shooting, it will be able to once again enlist the masses to rush the border fence to protest Gaza’s closure. The website of Islamic Jihad, which sends its young people to the fence protests, issued an official condemnation on Thursday against the violence used against demonstrators and demanded the release of all those imprisoned. “This is a violation of the right to demonstrate, which is part of the right of every citizen to express his opinion,” wrote the organization, which is not usually known for its concern for civil rights. The paradox is that under other circumstances, Israel would be pleased with the public protest in Gaza and see it as proof of the success of the closure policy, which it believes could lead to Hamas’ downfall. But the turmoil Hamas is experiencing worries Israel too. It needs a partner to take responsibility for running the Strip, stop a disintegration that could lead to a large-scale armed conflict on the eve of the election, and serve as an address for mediation. Suddenly it turns out that the confrontations at the fence are a marginal threat, if at all, compared to the risk of instability of the Hamas government. How vulnerable are NYC’s underwater subway tunnels to flooding? Hundreds of Arabs rioted along the Gaza border fence Friday afternoon, throwing rocks and firebombs at IDF troops – but the real action was in the interior of Gaza, where tens of thousands demonstrated against Hamas, demanding that the terror group provide for their welfare, instead of the “privileged groups” who have been receiving money and benefits over the years, protesters charged. Sources associated with Fatah on Saturday night distributed footage of a resident of the Jabalya refugee camp, Ahmed Abu Tahoun, who set himself on fire. According to the sources, Abu Tahoun was thrown out of his home because he couldn’t pay his rent. With that, Maariv quoted Israeli officials as saying that the footage was apparently old, and had been circulated last year. The official reason for the protests was the high cost of living in Gaza, but Kan News showed numerous video clips of dissatisfied Gazans slamming Hamas for their poverty. “They [Hamas] have houses, money, vacations, enough money to marry off their children, while we have nothing,” one protester says. “The time has come to sweep away this corrupt regime. If you do not listen to the demands of the people we will sweep you away,” another protester says. Footage shows Gazans throwing rocks at black-clad Hamas police, who chase the protesters throughout Gaza City and use live fire against them. Hundreds were reported injured, but the number could not be confirmed, because Hamas has been silent on the protests. Protesters reported that Hamas has been beating protesters and raiding houses, and that hundreds have been arrested. Among those arrested have been journalists who have been chronicling the events, protesters said. Palestinian Authority chief and Fatah chairman Mahmoud Abbas months ago shut down all transfer payments to Gaza, in an effort to incite Gazans against Hamas. As tens of thousands protested in Gaza’s towns and refugee camps against Hamas, several thousand also protested against Abbas, demanding that he end the “siege” against Gaza, and begin sending payments again. On Friday, Hamas, for the first time in a year, canceled the weekly demonstration at the Gaza border fence. The cancellation came after two Fajr missiles were fired Thursday night from Gaza at the Tel Aviv area. 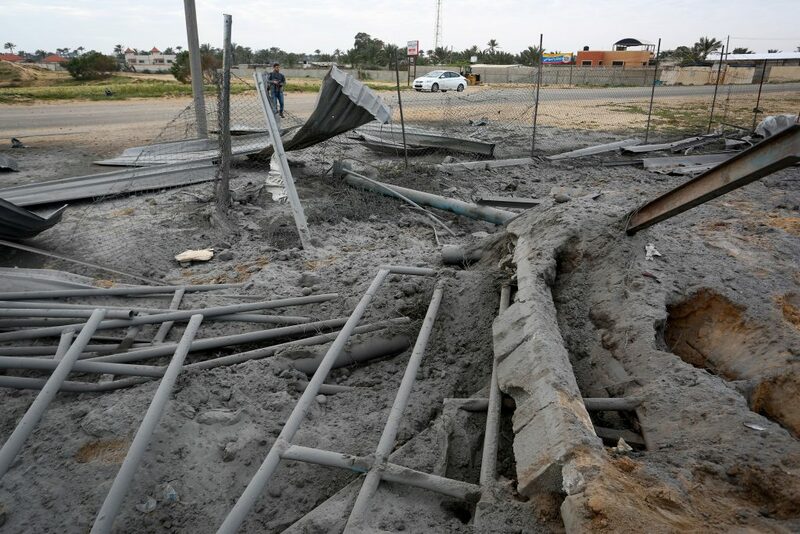 Both Hamas and Islamic Jihad denied firing the rockets, but the IDF responded by hitting over 100 Hamas targets in Gaza, causing heavy damage to the group’s infrastructure, as well as buildings and structures, including a port used by the terror group to conduct naval exercises. Despite the cancellation of the demonstrations, several hundred Gazans showed up anyway and rioted, and IDF troops used anti-riot measures to quell the crowd. The possibility of a nuclear war between Pakistan and India was widely debated in the past few days. Let us take a look at the aftermath of such a misadventure. Nine sovereign nuclear states across the world share between them approximately 14,000 nuclear missiles. Three nuclear flash points exist in today’s era: America and North Korea, Russia and NATO, and Pakistan and India. The Line of Control (LOC) between Pakistan and India is the most volatile place in the world right now as both nuclear states stare at the dreary possibility of a nuclear clash. A nuclear confrontation anywhere in the world would have similar effects: a smoky sky, long-term climatic effects, dead crops and starvation, radiation poisoning, skin cancer and genetically deformed births. Not to mention the countless casualties at the site of the nuclear explosion due to blast, heat, and fallout. Brian Toon, Professor of Atmospheric and Oceanic Sciences at the University of Colorado, has studied nuclear warfare for almost 4 decades. He summarised the aftermath of a nuclear war in this era as ‘the end of the world.’Within days of an atomic blast, the resultant hot soot (black smoke produced by incomplete combustion of hydrocarbons) would rise some miles above the earth up to the stratosphere where it would envelop the earth. This soot sheath would prevent direct sunlight and heat from reaching the earth, dropping the earth’s temperature. This is described as ‘nuclear winter’ with ice age-like conditions. Sunlight would be unavailable for plants to undergo photosynthesis – the process by which plants produce nutrients to survive and function normally. The immediate result would be dead crops and global starvation. Toon estimated that agricultural produce ceased following a nuclear clash would lead to worldwide starvation within 2 months. Exports would halt and millions would die as collateral damage. The ensuing smoke of a nuclear blast would create a near-global hole in the protective ozone layer triggering a global health crisis. Consequently, ultraviolet (UV) radiations from the sun would reach the earth unopposed and age skin cells and destroy their DNA, increasing the risk of skin burns and skin cancer. The same UV rays would also cause of permanent blindness. Hibakusha is a Japanese origin word used for the unfortunate victims of the 1945 atomic bombings of Hiroshima and Nagasaki. 74 years into this tragedy, and babies are still being born with genetic deformities. A nuclear war in the South-Asia would be disastrous for generations to come. Bone marrow death – wherein red blood cell, white blood cell and platelet production decreases – is another deadly outcome of an atomic explosion. This increases the likelihood of infections and bleeding. Two of the world’s smallest nuclear powers and poorest countries, where majority live under the poverty line have egos the size of an ox. What Pakistan and India have achieved by decades of stubbornness and wars could easily rest on an eyelash. The need of the hour is a pragmatic leadership on both side and not just an alpha-male who is solely focused on proving his masculinity by playing to the right-wing audience at home. There needs to be compassion, communication and transparency on both sides of the LoC. The real battle starts once the nuclear war ends. This battle is fought on multiple fronts to combat health, environmental, economic, political and infrastructural challenges. All possible strategies have been employed by Pakistan and India such as wars, oppression, proxies and baits. Peace needs to be given a chance. The so-called Poseidon strategic missiles, carrying up to 200 megaton warheads, will be deployed by 2020 and could wipe out the likes of Los Angeles, according to reports. Russian President Vladimir Putin’s military plans to deploy the weapons on the new Project 09852 sub Belgorod — a converted nuclear-powered submarine. Russia’s state-owned news agency Tass, citing a Moscow defence source, claims the underwater warships could carry six of the Poseidon torpedoes. In January, Fox News reported a former senior adviser to US President Doanld Trump admitted there were “genuine concerns” about the plan. Former State Department senior adviser Christian Whiton said a blast would create a “wave — and a highly irradiated one”, but because the water would absorb a lot of the energy, the wave would be less damaging than getting hit by the bomb itself. The Poseidon nuclear drone was revealed by Russia’s defence ministry in May 2018. Picture: Ministry of Defence of the Russian Federation. A prototype doomsday craft took to the waves for the first time on Christmas Day to begin undersea trials, Tass news agency reported. The drone is said to be powered by a miniaturised nuclear reactor, which has been fitted to the rear for ocean tests. Russia is quick to flex its military muscle. Before Christmas, it was expected development of the weapon was at an early stage and the craft was being carried by one of the Russian navy’s nuclear submarines “as part of experimental design work rather than full-fledged sea trials at this stage”, the source told Tass. Mr Putin revealed the existence of the state-of-the-art new weapon earlier in 2018 and claimed it would be able to whizz through the ocean almost silently at up to 70 knots. He said: “It is really fantastic. They are quiet, highly manoeuvrable and have hardly any vulnerabilities for the enemy to exploit. Poseidon — originally called the Status-6 Oceanic Multipurpose System — got its name after a Boaty McBoatface-style public poll by Russia’s Defence Ministry. The massive unmanned sub is being developed by the Russian Defence Ministry. The drones will be armed with conventional weapons and a two-megaton nuclear warhead with the “primary purpose” of destroying naval bases, according to reports in Russia. However analysts at the Pentagon — who use the name Kanyon for the drones — are said to believe they will carry “tens of megatons” of explosive power. Experts have said that kind of blast underwater could be enough to trigger a tsunami as powerful as the one that killed 20,000 people in Japan and knocked out the Fukushima power plant in 2011. Some reports claim the resulting wave could reach 90 metres, swamping entire cities. And there are fears it could blow ocean sediment into the air, generating a deadly radioactive dust cloud. Russia’s navy had previously said they hoped Poseidon would be in service by 2027. The claimed miniature nuke reactor — said to be 100 times smaller than previously achieved — allegedly powers the Burevestnik 9M730 cruise missile. That was also unveiled earlier in 2018, part of an arsenal of advanced weapons Russia claims is capable of thwarting the most modern defences to help it win a potential World War III.